Dr. Calvin Mackie is an award winning mentor, a former engineering professor, an internationally renowned motivational speaker, and a successful entrepreneur. His message as a mentor, speaker, and entrepreneur continues to transcend race, gender, ethnicity, religion, and time. After starting college in remedial reading because of weak SAT scores, Calvin Mackie earned a Bachelor of Mechanical Engineering from Georgia Tech and a B.S. in Mathematics from Morehouse College in 1990, a M.S. in 1992 and the Ph.D. in 1996 in Mechanical Engineering from Georgia Tech. He served on the Tulane University faculty from 1996-2007, where he received tenure and was promoted to Associate Professor in 2002. 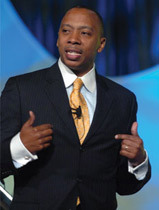 A professional speaker, in 1992 Calvin Mackie founded the Channel ZerO Group LLC (CZG), an educational and motivational consulting company and has presented to numerous civic, educational institutions and Fortune 500 corporations. Through his national and international travels and online mentoring presence, Mackie reaches millions of youths and professionals annually. A member of the Phi Beta Kappa, Pi Tau Sigma and Tau Beta Pi National Honor Societies, his passion for scholarship is well established. His leadership qualities and social justice advocacy are well documented. In 2008, Dr. Mackie participated in the inaugural class of Fellows in the Effective Leadership Program of the Center for Leadership and Public Values at Duke University and the College of Business of Southern University (Baton Rouge). In 2005, former Louisiana Governor Kathleen Blanco appointed him to the Louisiana Recovery Authority (LRA), the guiding agency to lead the state’s rebuilding efforts following Hurricanes Katrina and Rita. Possessing instant social, political, cultural, and technical credibility, Calvin Mackie was featured prominently in Spike Lee’s HBO Katrina documentary, When The Levees Broke: A Requiem in Four Parts (HBO 2006) and it’s successor If God Is Willing and Da Creek Don’t Rise (HBO 2010) and has appeared on numerous national and local news shows including the PBS News Hour with Jim Lehrer. Mackie received international acclaim during and after a 2006 visit to the country of Kuwait as an ambassador of the LRA and the guest of the U.S. Embassy in Kuwait, appearing on Good Morning Kuwait and in numerous international Arab newspapers. In 2004, President Bush awarded him the 2003 Presidential Award for Science, Mathematics, and Engineering Mentoring in a White House Ceremony. Dr. Calvin Mackie has received numerous other awards including the, the 2003 National Title One Distinguished Graduate for Louisiana, 2002 Black Engineer of the Year Award for College Level Educator, the Pi Tau Sigma/ASME Excellence in Teaching Award in Mechanical Engineering for 1999-2000 and 2001-2002. In 1996, he received a patent on a device to retrofit luggage stowbins on 737 and 757 Boeing commercial airliners. In 2009, Louisiana Lt. Governor Mitch Landrieu appointed Dr. Calvin Mackie to the Louisiana Council on the Social Statue of Black Boys and Black Men. As Chairman, he is leading the state’s effort to create policy and programs to positively impact the quality of life of Black males and families in the state of Louisiana. Calvin Mackie is currently a partner in Golden Leaf Energy (GLE). GLE promotes and distributes the alternative fuel. GLE produces biodiesel and ethanol from waste streams and distributes to numerous commercial clients. GLE is reducing waste in landfills while providing clean biofuels for the nation. Presently, Golden Leaf Energy is the exclusive alternative fuel supplier for the federal fleet cars in the state of Louisiana and Hollywood South. Dr. Calvin Mackie is the author of the book: “A View from the Roof: Lessons for Life and Business”. Dr. Mackie is a devoted husband to his wife, Tracy, and father to his two sons, Myles Ahmad and Mason Amir. A university professor. A restaurateur. A Hollywood leading man. The Mackie Men of New Orleans have made success a family tradition. In A View from the Roof, Presidential Award-winning speaker Dr. Calvin Mackie reveals just how they did it. Through a slideshow of poignant stories involving the Mackie brothers' tough-as-nails roofer dad Willie, readers will learn the hands-on, humorous lessons that propelled Calvin and his brothers to the top of their professions. From the hot gable rooftops of New Orleans to the set of a Spike Lee film, this book will leave readers with a view they'll always remember.